Baseball has the MLB, Basketball the NBA, but for wrestling there is only one goal that collegiate wrestlers aim to achieve - a national title. Wrestling is not a sport of glamour. There are no cheerleaders, no jumbotrons and you never see anyone wearing a jersey of their favorite national wrestler. For those who wrestle, however, it doesn’t matter. They love the challenge; the late nights drilling the same move, over and over again; the rigorous diet; and the dreaded weight cutting. Baseball has the MLB, Basketball the NBA, but for wrestling there is only one goal that collegiate wrestlers aim to achieve – a national title. Wrestling is not a sport of glamour. There are no cheerleaders, no jumbotrons and you never see anyone wearing a jersey of their favorite national wrestler. For those who wrestle, however, it doesn’t matter. They love the challenge; the late nights drilling the same move, over and over again; the rigorous diet; and the dreaded weight cutting. For two Springfield College students, the work has paid off. Juniors Dylan Foley and Eric Hamrick will be competing in the Division III NCAA Tournament in Cedar Rapids, Iowa, on March 14-15 for a shot at their dream. Foley, wrestling in the 165-pound weight class, is as smart and respectful as he is intimidating. The prototypical wrestler, Foley is as tough as it gets. His shoulders appear as they are going to tear through his jacket, and he sports cauliflower ear, which he has accumulated from every match he has ever had. He walks with confidence, boasting a 38-6 record representing the years of work and dedication he has put into the sport. This week, it all comes together. Foley started last year in the 149-pound weight class. 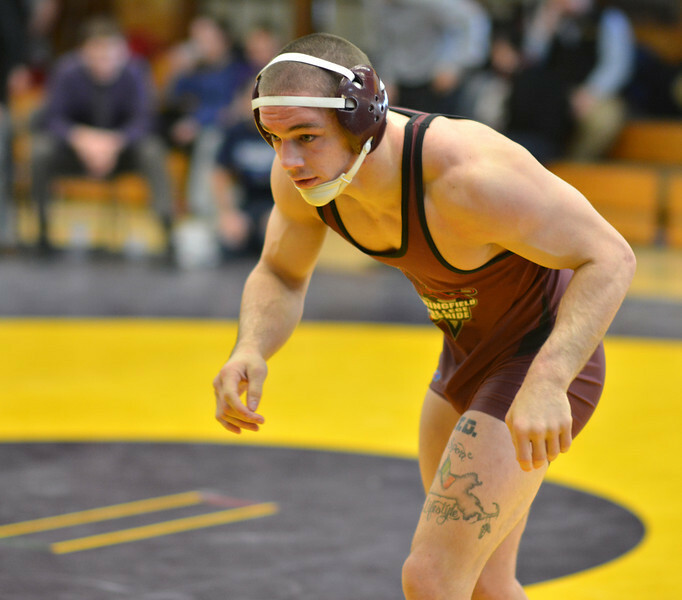 Through hard work and dedication, he built himself up to the powerful 165-pound wrestler that he is currently. Although there was some minor skepticism about the jump in weight, he hasn’t missed a beat. Besides making it to the NCAA Tournament, a major highlight for Foley was his 3-1 victory over the No. 2 wrestler in the nation at 165, Dave Pinto. Unlike his teammate and last year’s national champ, Devin Biscaha, Foley’s style of wrestling is what he calls, his “no mas,” style. Foley isn’t afraid of a challenge or getting roughed up. He fights hard and never lets the pressure get to him. While Foley goes toe-to-toe with his opponents and wears them down, Hamrick is dangerous in his own respect. With a 24-3 record this year, Hamrick has proved that he is a wrestler to be on the lookout for. Both wrestlers are ready. They have put their hours in on the mat, have mentally prepared and both are hungry to make a name for themselves at the NCAA Tournament. Walking through the hallway of the P.E. Complex towards the wrestling room, it is hard not to be motivated. There is a wall covered in plaques of the All-American wrestlers that precede Foley, reminding him why he’s here. “I came here for the wrestling program,” Foley stated. “This is one of the best programs in the country and one of the best coaching staffs in the country.